The most romantic day of the year is just around the corner, which means its time to start making plans to ensure that the day goes as smoothly as possible. Now the dream may be for your significant other to whisk you away for a weekend in Paris – the city of love – but we know that this isn’t manageable for everyone, so some suitable alternatives can be created right in the heart of your home. The lighting that you have inside of your home is vital to the overall feel, dictating the tone and mood of the entire room. This blog looks at the 10 best romantic bedside lamps to bring into your home this Valentine’s Day, so keep reading to find out how you can create a wonderful romantic theme within your home’s designs! Starting off the list, we have the sophisticated Allium 3 Light Table Lamp in Satin Nickel – a sophisticated modern lamp which will give a romantic sparkle to any bedroom. 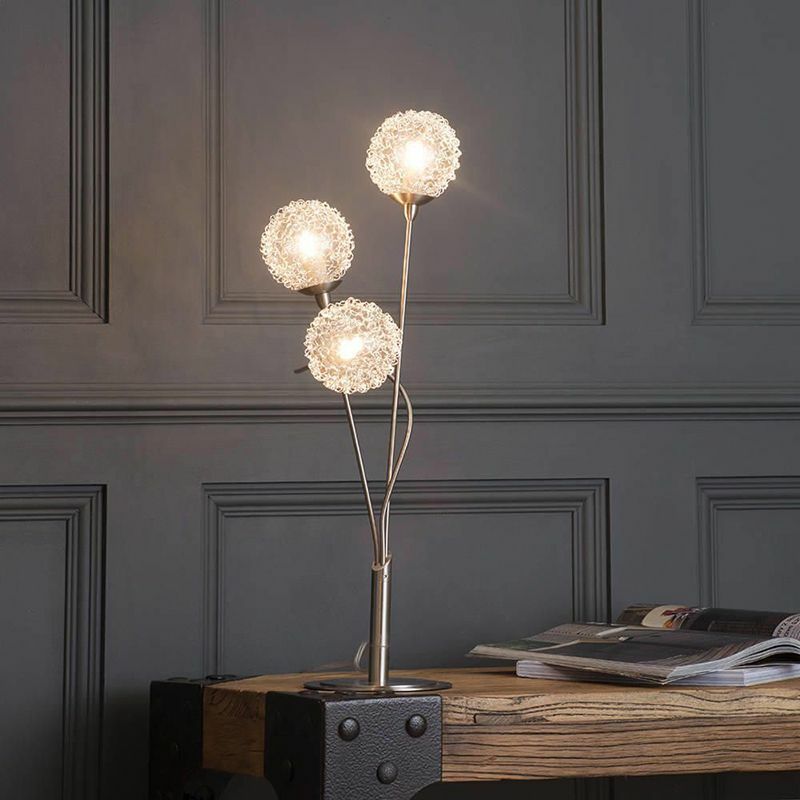 The lamp features a 3 light design, with each light being surrounded by a wire ball feature for a unique twist to the image and tone of the light. 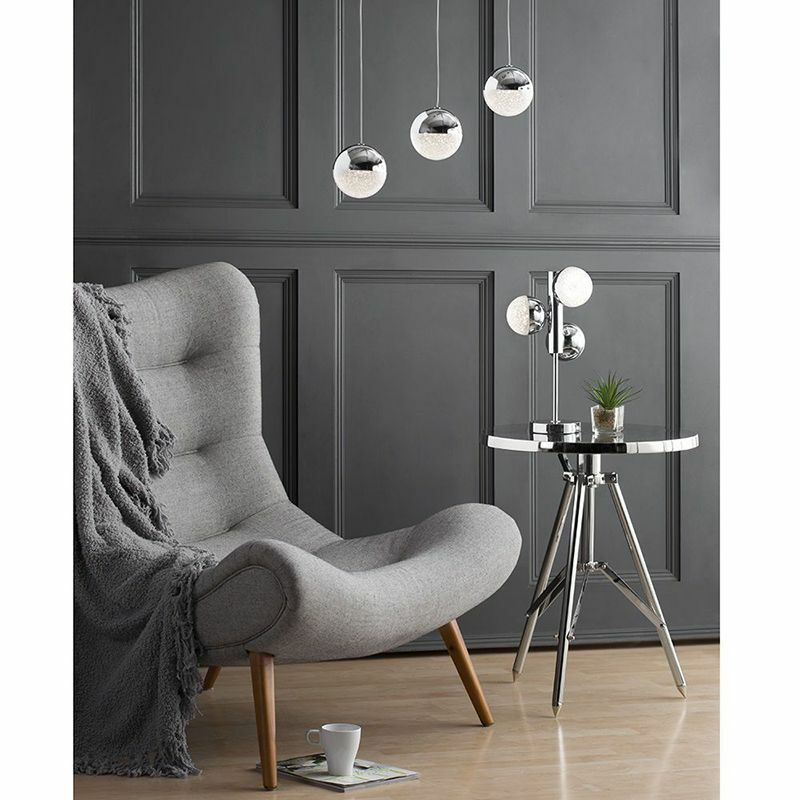 This stylish satin nickel lamp is ideal for any urban and contemporary interior, thanks to its unusual design and simplistic image. The lamp gives a soft shine to the bedroom and can create a wonderful environment to relax and unwind with your significant other. Copper is a brilliant tone to bring into any household, giving a stylish industrial image to the room that it is featured inside of. 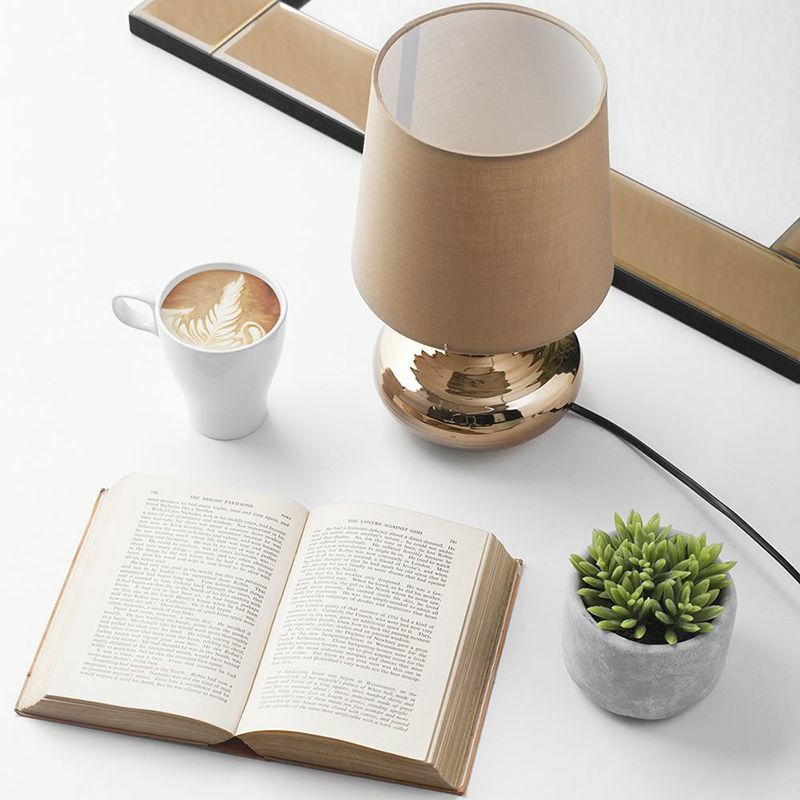 For an elegant way to bring soft and soothing light into your home, the Mini Scratched Table Lamp with Light Beige Shade in Copper is a superb choice, with the smooth copper structure giving a very fashionable theme to the household. The lamp is ideal for your bedside table and is sure to work well with a stylish industrial themed interior, thanks to the sleek design, unique scratched effect, and create a relaxing glow that is very comforting. 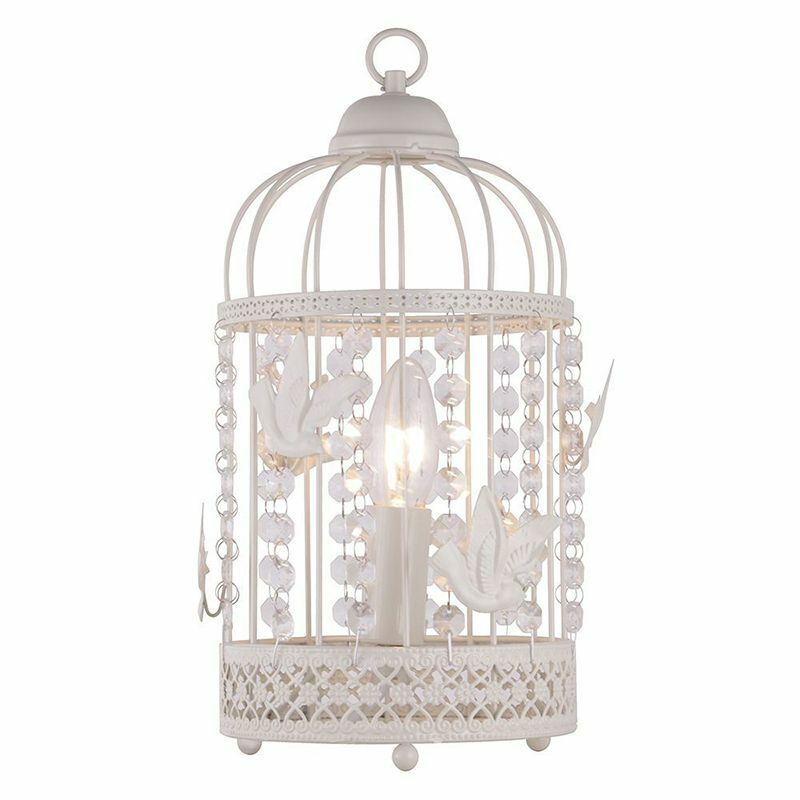 Unique lamps such as this 1 Light Distressed Effect Birdcage Table Lamp in White help to give your interiors a sense of character and personality, making them a more comfortable and relaxing place to spend your time. This piece has a birdcage inspired design and is great for giving an outdoorsy and adventurous theme to an interior. The eccentric design of this lamp helps to bring a very natural feel to your home, which helps to create a simplistic and laid-back environment that is perfect for relaxing inside of with a partner this Valentine’s day. Elegant lighting helps to give a classy and sophisticated feel to the interiors inside of any household, which is ideal for a cosy Valentine’s day theme. This sparkling crystal table lamp has a unique design and gives a wonderful shine to the room, creating the perfect environment for cuddling up next your partner whilst watching a movie. 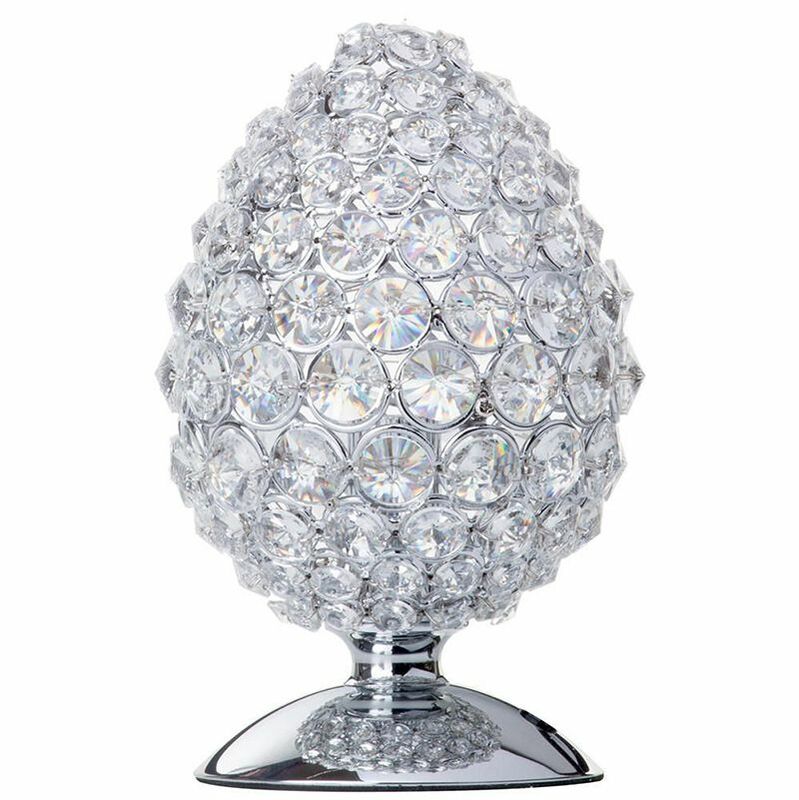 This fashionable crystal table light gives a stylish modern image to your bedroom and will give a soothing spread of light to the surrounding area to create a softer and more relaxing atmosphere. This is sure to make you want to cuddle up to your partner and watch a film before you fall asleep. Next up we have a vintage style piece which is sure to offer a very classy feel to your bedroom. The decanter style 4 light cluster gives a retro elegance to any interior that it is used inside of, as you can arrange the 4 lights to suit the interior and space surrounding it to offer a very soft and comforting glow to the décor. 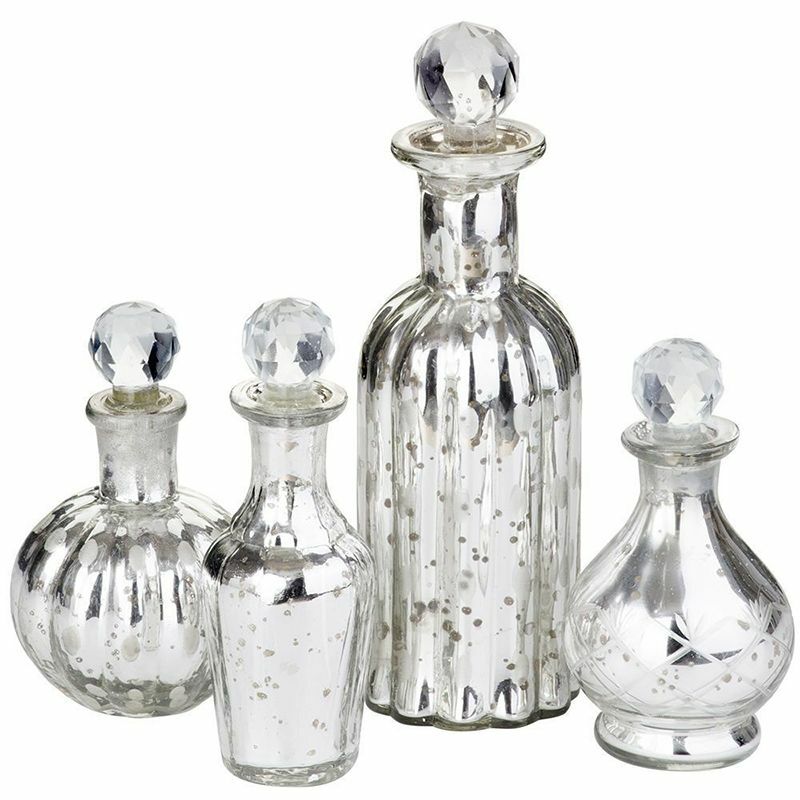 This stunning 4 light cluster features decanters of varying sizes and styles for a unique and authentic retro image, which is sure to give a truly elegant tone to the household. 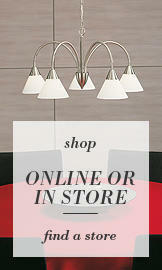 Finished in a sophisticated glass effect, the lamps offer a wonderful shine to the surrounding area. Another unique lamp that will give a stunning image and feel to your bedroom is the Bell Jar Table Light in Dark Wood & Copper, with the inventive design giving a soft and sparkling glow to the room. 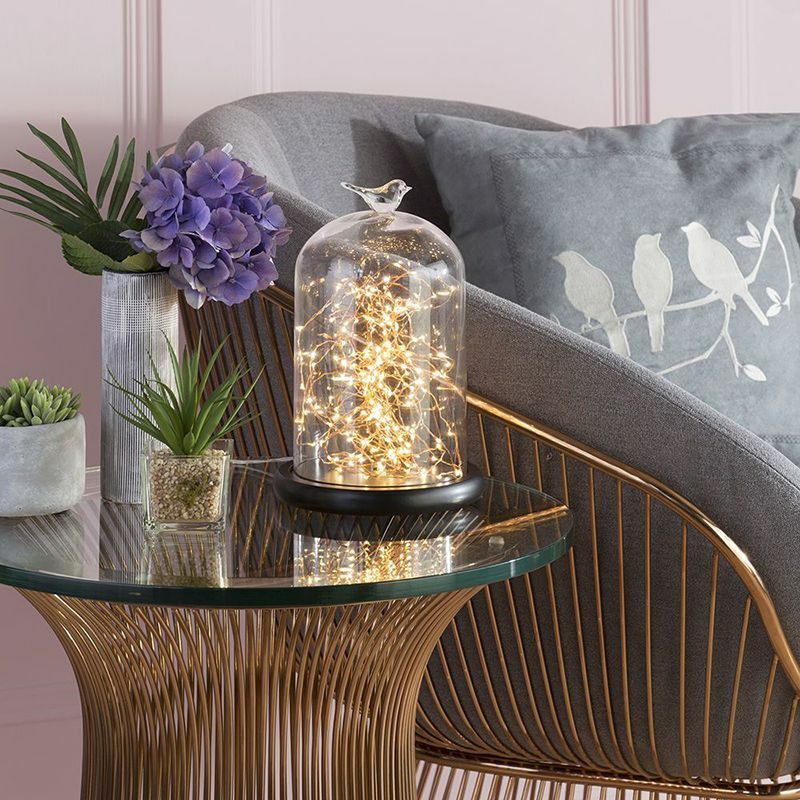 The jar features a cute bird detailing and is filled with copper wire string lighting which shines in an unusual yet sophisticated manner. This stunning lamp has a dark wood base and a smooth glass cover, giving a simplistic and natural look to the room, whilst the inner copper string gives a soothing shine to the interior for a magical feel. The lights used are also LED, which means the piece has a long lifespan and will give a gorgeous theme to your home every Valentine’s Day! This floral inspired light will give a wonderful tone of romance and simplicity to your home, with the lantern style structure being suitable for use on any bedside table to give a soft wash of accent light to the surrounding area for a more comforting feel. 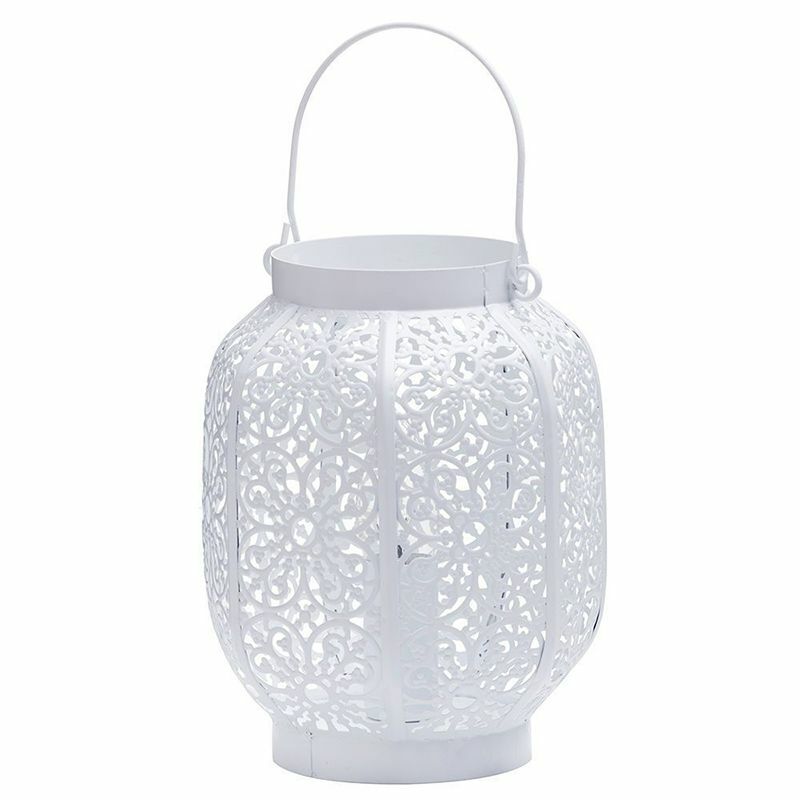 Finished in white, the lamp will give a bright and uplifting feel to your home which is ideal for Valantine’s activities! The lamp comes with a decorative handle which helps to give a true to life lantern image, whilst the cut out floral design allows you to create a truly unique and comfortable atmosphere inside of your home and its interiors. Utilise this light in a bedroom which has a lighter and brighter tone. A higher class and more energy efficient option for your home is the Bulla 2 Light Table Lamp with Bubble Glass Shades in Gold, which features integrated LED lights for a long lasting and reliable shine inside of your home. 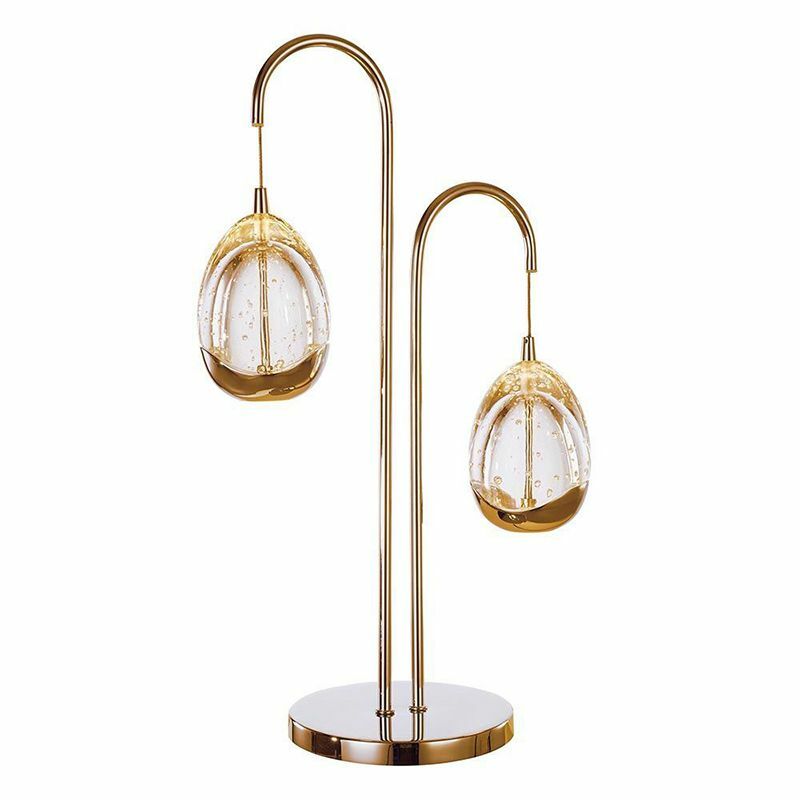 The gold piece gives an elegant modern tone to your home, with the stunning bubble glass shade giving a beautiful glow to the household. The bulla 2 light table lamp is a stunning contemporary piece which has a wonderful sense of modern elegance, making it the perfect addition to homes looking for a sophisticated feel and updated image. 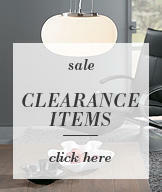 The lamp sparkles and shines beautifully and gives a really classy feel to any household. Contemporary lights are an ideal way to give a modern twist to your home’s interiors, however this stylish Corona 3 light Vertical Spiral Table Lamp in Chrome does so whilst also creating a soft and intimate spread of light within the room which is great for offering a cosy and relaxed atmosphere. The 3 light piece has 3 sparkling integrated LED lights with give a wonderful feel to the interior. Our Corona table lamp is the pinnacle of contemporary lighting, with the shimmering LED lights giving a magnificent glow to the interiors. The soothing feel is sure to make you far more comforting, allowing you to have a relaxed Valentine’s day. 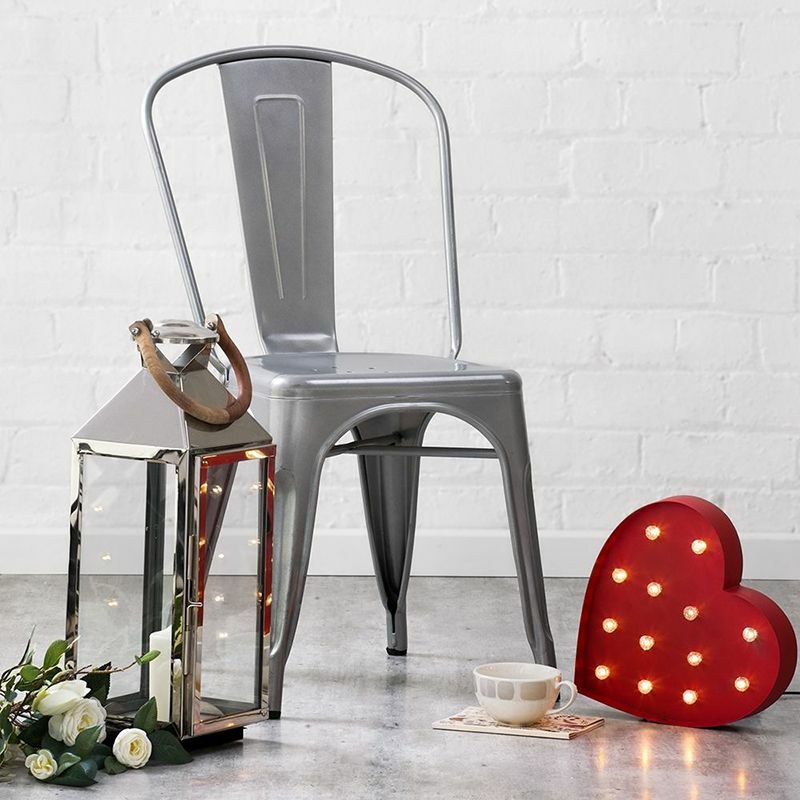 Last, but certainly not least, is our fantastic Novelty Heart Shaped Table or Wall Light in Red, which brings an iconic Valentine’s Day look into your home. The heart shaped light comes with a set of integrated LED lights attached to it, giving a durable and effective glow to the room. You can use this light to set the tone for your Valentine’s day event, which is sure to help keep the romantic theme flowing! Following these tips is sure to help you to create the perfect Valentine’s day theme without even leaving the comfort of your own home, allowing you to have a wonderful day with the person you hold closest to your heart. 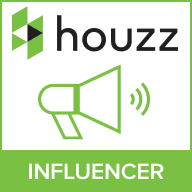 For more helpful hints and guides for your home, you can take a look at our blog page which offers inspiration for every room within the household. You can browse the full Litecraft range by browsing our selection both online and in store, helping you to give truly stunning light to your home.